There's no summer destination as quintessential as the Greek Islands, and even there, no more ultimate destination than Mykonos. Despite the bad buzz that has dogged the Hellenic Republic the last few years, a small team of talented filmmakers have spearheaded the production of a wonderful new movie, intended to make us fall in love with Greece all over again. I spoke to one of the producers, Alexia Melocchi, and to the Australian father and daughter screen writing team Peter and Helene Paroulakis. I also spoke to the director Jim Fall about the magic and mystery of Greece and the forthcoming movie As Greek As it Gets! Alexia's partner, Alexandra Yacovlef who is the Executive Producer of As Greek as it Gets was born in Greece and the mother/daughter team, though based in the USA for decades, have enjoyed the country on regular summer and winter visits. Alexia: Helene Paroulakis sought me out during the Los Angeles Greek Film Festival two years ago as I am one of its Advisory Board Members. She wanted to ask me if I would read her script and give my opinion as she knew my mother/ partner was Greek and I would have related with the subject matter and the fact she works with her father Peter. I read the screenplay and consulted with her and her father on a rewrite. After six months we decided to represent the screenplay as their Literary Managers and after having secured /attached some elements to it such as director and a producing partner in Greece we transitioned to becoming the Producers on the project. Peter: My daughter Helene and I began writing screenplays together as a team several years ago. Our aim was to combine our different talents and experience to produce a quality movie script for eventual theatrical release. A screenplay is a unique art form which unlike a play or novel is a visual experience where actions rather than words tell the story. American authority, Robert McKee, writes that a 'good' story means something worth telling that the world wants to hear. A need for creative power that puts things together in a way no-one has dreamed. A vision driven by fresh insights into human nature and society coupled with in-depth knowledge of your characters and world...and a lot of love. This is the challenge Helene and I took up and the result is our screenplay As Greek As It Gets. Alexia: One of my all time favorite movies was SUMMER LOVERS. 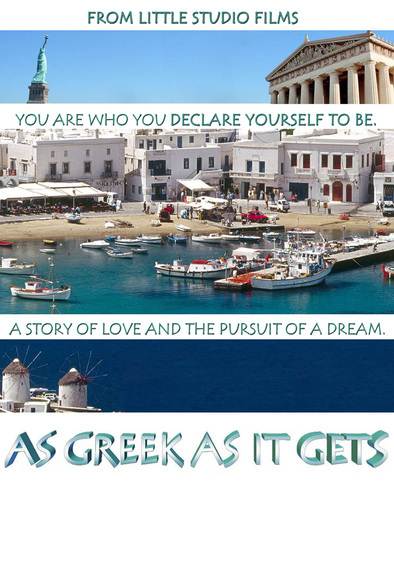 After that there have been quite a few movie showcasing the beauty of the Greek islands but what I felt this screenplay did which was different is the old time fashioned romantic comedy formula we see in films like HIGH SOCIETY with Grace Kelly etc..I liked that it was written in that style. Without the music. Peter: The story for our movie comes from a great wish to showcase the magic of Greece and its people -- both in Greece and abroad. The result is a sparkling romantic comedy set on location in New York and Mykonos. Jim Fall: What drew me to As Greek as it Gets is that it's both a classic romantic comedy like William Wyler's Roman Holiday, and a modern love story about identity, and being able to reveal one's true self in order to find love. It's also mostly set in Greece, one of the most beautiful and romantic places on earth. Alexia: Jim Fall was the ideal director for us. He is great with comedic timing and having never been to Greece will look at the experience of filming there with the innocence and wonder we want the audience to experience when the film makes it to the screen. Helene: Of course since the financial crisis in Greece we have felt an even greater need, as have many others abroad, to do what we can to give confidence and international exposure to a long-suffering and courageous people. It is 50 years this year that Zorba the Greek was filmed on the little beach of Stavros in Hania, Crete. Look what that movie achieved. It put Greece on the map overnight. It gave birth to a new Greek culture of vitality and energy and an explosion of life and fun that spread throughout the world. To this day! Whilst in Athens and Mykonos a few weeks ago I could not help telling the Greeks I met that the Greeks are not poor. They are the richest people in the world. They live in a country that has all the natural and human wonders imaginable. Yes, Greece is a magic country. But we must all help to maintain and preserve that magic. It is essential that a movie that brings out the best of Greece and Greeks on an international, not domestic level hits the big screen soon and is seen by as many people world-wide as possible. We hope As Greek As It Gets will achieve that objective. Alexia: It' s important for us to make this movie. We at Little Studio Films have always wanted to show to the world a Greece that is modern, cosmopolitan, glamorous and vibrant but all the Greek projects that were sent to us were imitating other European movies forgetting that Greece has amazing talent and creativity in its blood. So when we read As Greek As It Gets coming from Greeks like us that reside outside of Greece, we were thrilled to have found the right script for a film. This is a way to honor my roots and my family and to celebrate the wonderful memories I have from spending all my summers in Greece since I was a toddler. The hospitality, generosity and kindness of the Greeks is quite special. Greeks love people and place a lot of value in human contact. We wanted to show that going to Greece can be a magical experience of self discovery. That is the Greek spirit..sit at a table with good food, near the water, and talk about LIFE.